Once per turn: You can equip 1 "Inzektor" monster from your hand or Graveyard to this card. While this card is equipped to a monster, that monster's Level is increased by 3, also it gains ATK and DEF equal to this card's ATK and DEF. While this card is equipped to a monster: You can send this Equip Card to the Graveyard to target 1 card on the field; destroy that target. This card is similar to Kamen Rider TheBee, as they're both based on wasps. This is backed up by the fact that they both use weapons around the wrist area. 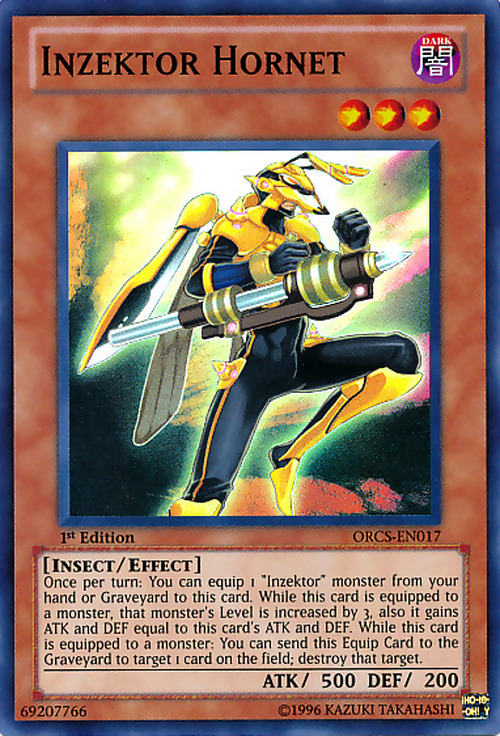 This card's effect is similar to a hornet's sting, as it can be reused offensively over and over by equipping it to other Inzektors, such as in the Inzektor Dragonfly or Inzektor Centipede combo. This card, along with Inzektor Dragonfly, is among the first Inzektor cards to be Limited. The effect to equip an "Inzektor" monster from the hand or Graveyard to this card does not target. The effect that destroys 1 card on the field targets. You can destroy 1 card on your side of the field. If multiple copies of this card are equipped, the effects of each of them are applied. You can send an "Inzektor Hornet" that is equipped to an "Inzektor" monster to the Graveyard while "Dimensional Fissure" is applied to activate its effect, because it is treated to be sent to the Graveyard as an Equip Spell Card. However, if "Macro Cosmos" is active, cards cannot be sent to the Graveyard, so the effect of "Inzektor Hornet", when it is treated as an Equip Spell Card, cannot be activated. : If "Dimensional Fissure", ect, is active, can the effect of "Inzector Hornet" when it is treated as an Equip Spell Card be activated? "Fairy's Hand Mirror" or "Fiend's Hand Mirror" cannot be chained to the activation of the effect of an equipped "Inzektor Hornet" that destroys 1 card on the field. : Can "Fairy's Hand Mirror" or "Fiend's Hand Mirror" be chained to the activation of the effect of an equipped "Inzektor Hornet" that destroys 1 card on the field?